George F. Shafer was born on November 23, 1888 in Mandan, Dakota Territory to Eva and Charles Shafer. In 1883, his father Charles became the first permanent white settler in McKenzie County. Only in 1890 did he move his family from Mandan to Shafer, ND (five miles east of today’s Watford City) which had been named after his father, Charles. His siblings included brothers Charles, Jr., Fred and sister Katy (Fairelly). George graduated from Williston High in 1908. He attended the University of North Dakota - Grand Forks and and was a member of UND's intercollegiate debate team. He graduated valedictorian of his class. Returning to his hometown in 1913, he began his law practice in a homestead shack that had been moved into town. By the next year, he was appointed state's attorney of McKenzie County. He was re-appointed to a second term. Upon completion of his second term, he returned to private practice until 1921 when he was appointed a ND Assistant Attorney General. In 1922, he was elected ND Attorney General. Shafer was politically affiliated with the old Independent Voters Association, formed at to combat the Nonpartisan League faction (NPL) of the Republican Party. The IVA did not support state ownership of industry. Lt. Governor Walter Maddock, assumed the chief executive’s role upon the death of Republican Governor A.G. Sorlie in 1928. But Maddock switched to the Democratic Party for his own bid for governor. Shafer won both the Republican nomination and November 1928 gubernatorial election against Maddock. He served as Governor of North Dakota from 1929 to 1933. Among the most severe problems facing his administration were drought and low prices for agricultural products. As governor, he was ex-officio head of the state-owned Mill and Elevator Company. To his credit, the Mill and Elevator showed a good profit under Schafer's direction, despite the weather and economic conditions. But on his recommendation, the legislature transferred responsibility for its managment to the State Industrial Commission. On December 28, 1930, the Capitol building burned down, probably started by spontanous ignition of oily rags piled in a janitor's closet. The rags had been used to clean and varnish legislators' desks in preparation for the January 6, 1931 opening legislative session. 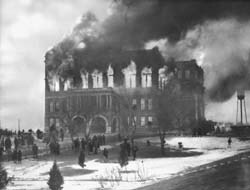 The fire broke out on the top floor of the four-story Capitol and ate its way downward, devouring records dating back to the days of Dakota Territory. Governor Shafer came back from a trip to St. Paul while the fire was burning. He immediately convened a team of state leaders to discuss emergency steps for coping with the loss of state records and work space. A commission, lead by former Mandan resident Frank Anders, was formed to oversee the design and construction of the new Capitol. Construction began in 1932 and was completed in 1934 for $2 million. Governor Shafer also appointed ND's first game and fish commissioner, Burnie Maurek in 1930. 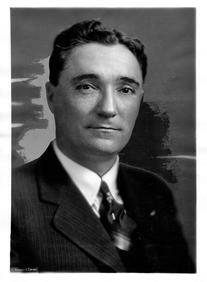 Shafer sought the state’s US Senate seat in 1932 rather than run again for governor, but lost to incumbent Gerald Nye in the Republican primary. William Langer won both the Republican nomination and general election for governor. Both were members of the NPL faction of the party. Shafer retired from public life after losing the race for the Senate in 1932, and devoted his time to his private law practice and numerous community activities. He served as council president of the Missouri Boy Scout Council. He was also involved in Kiwanis International, where he held numerous local and state offices. Shafer was also active in the International Order of Odd Fellows, the Masonic Lodge at Alexander, ND the Scottish Rite in Bismarck, the American Red Cross, and the Bismarck-Mandan Executive Club. He was a past president of the North Dakota Bar Association and a member of the American Bar Association. He was a member of the Presbyterian Church in Bismarck. He married the former Frances Kellog at Shafer Sept 1, 1915. The couple had three sons, George F. Jr., Richard K., Charles D. and one daughter Virginia H. (McCormick). He died in Bismarck, North Dakota on August 13, 1948 at the age of 59 and is buried in St. Mary's Cemetery in Bismarck. Note: Many biographies identify George's hometown as Watford City but it was not founded until 1914. Many maps still denote the location of Shafer. The only remnant of the town is the Shafer Jail, constructed of native stone and concrete, which served the community for 31 years. This building held Charles Bannon, the confessed killer of six members of the Albert E. Haven family and the last person lynched in North Dakota. An angry mob stormed the jail January 29, 1931 and hanged Bannon from the Shafer Bridge located a short distance away. An article in Time Magazine on February 9, 1931 reported the mobsters wore masks, and did not shoot holes in the dangling body. The article also quoted then Governor George Shafer "Lynch law in North Dakota should not be tolerated" of the events in his hometown.